Saying the bill doesn't specifically target Gov. Rick "Medicare Fraud" Scott, Florida lawmakers have introduced a bill allowing voters to recall state-level elected officials. Many Florida cities and counties have recall mechanisms for local politicians, but there's no such ability at the state level. If the legislation is approved, voters would have four months to circulate a recall petition throughout Florida. For statewide public officials, signatures would have to be collected in all 67 counties. If the signatures equal 15 percent of the total votes cast in the last election, then a recall election can be held. Public officials include the Governor, the Lieutenant Governor, and a member of the Cabinet. Under the legislation, a petition can also be used to recall a state legislator. However, that petition would need signatures from the district the lawmaker represents. To have a recall election for that legislator, the signatures must equal 20 percent of the total votes cast in the last election for that office. Only voters from the district would be able to vote in that recall election. 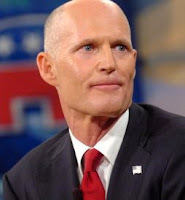 Purely by coincidence, the bill's filing came on the same day that Scott rejected billions in federal stimulus money meant to build a high-speed rail link between Orlando and Tampa. Scott's move infuriated legislators on both sides of the aisle and a bipartisan coalition has vowed to overrule him.